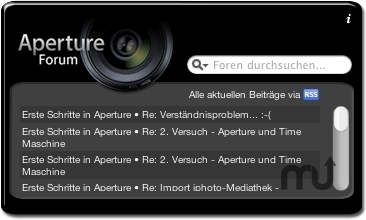 Search German forums for Aperture info. Is there a better alternative to Apertureforum Widget? Is Apertureforum Widget really the best app in Applications category? Will Apertureforum Widget work good on macOS 10.13.4? The Apertureforum Widget is designed for searching the first German-speaking forums for Aperture, Apple's all-in-one post-production tool for photographers. Apertureforum Widget needs a rating. Be the first to rate this app and get the discussion started!